This photo as well as others appearing on page 6 were taken at the MIT Museum’s 15th annual Friday After Thanksgiving Chain Reaction Event in Rockwell Cage on Friday. Participants linked their individual chain reactions to form a large Rube Goldberg machine that transported a golf ball around the gym. EDITOR IN CHIEF; LAST UPDATE 9:05 P.M.
On Nov. 6, Thomas Massie ’93 was elected as U.S. Representative for Kentucky’s Fourth District. Massie graduated from MIT in 1993 with a Bachelor’s degree in Electrical Engineering and also received a Master’s in Mechanical Engineering from the Institute in 1996. Massie, a Republican, won the seat after a seven-way primary and has already been sworn in due to his predecessor’s early retirement. Now in its 16th year, MIT’s Externship Program will connect 332 undergraduate and graduate students to alumni-sponsored externships this January during Independent Activities Period (IAP). 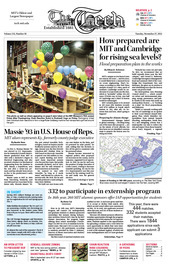 Run by the MIT Alumni Association, the program began offering short winter internships (“externships”) in 1997 for 20 to 25 students in its formative years. This year’s 332 is a new record, over last year’s 294 participants, according to numbers provided by Katie C. Maloney, Director of Parent Association and Student/Alumni Relations. MIT announced last Tuesday that it would file a new zoning petition for its area of Kendall Square “as soon as possible.” The changes will be presented in advance to the Cambridge Planning Board on the evening of Tuesday, Dec. 4, and the formal filing is expected to soon follow.